Dahls are delicate... and dangerous! In 1984, a team of cave explorers were surveying Dahl Sultan, a maze of passages beneath Saudi Arabia's Dahna Desert. Ron Kummerfeldt, a Kenyan instructor in desert survival, spotted a side passage no one had ever entered. "I'm going to check this one out," he told his companions. "See you in a few minutes." The passage was typical of Dahl Sultan: rock projections reached out from every side like thick tentacles trying to catch or trip up the unwary visitor. Kummerfeldt made his way carefully. Because the entrance to Dahl Sultan had recently been opened with hammer and chisel, he knew he was the first person in history to step into that dark gallery. Then, for some reason, he happened to glance upward. There was a hole in the ceiling above him... could there possibly be a room up there? Kummerfeldt took off his backpack, placed it on the floor, and began to climb. An instant later, his head popped into a low passageway... it looked like he'd discovered a second level to Dahl Sultan, a cave above the cave! On hands and knees, Ron Kummerfeldt crawled forward, hoping the small tunnel might open up into a large chamber. A moment later, it did open up, but not as Kummerfeldt expected. With a rumble, the floor beneath him gave way and the surprised caver found himself falling into darkness... quite literally, because his headlamp had gone out the moment the floor collapsed. Now, he lay who-knows-where, only slightly bruised, but surrounded by an inky blackness that is never experienced on the surface, even on the darkest night. As you would expect a survival trainer to do, he remained calm, did not move and methodically took stock of the situation. "My headlamp seems to be broken, but the torch that was in my hand when I fell has to be somewhere around here." Not wanting to move for fear of another collapse, Kummerfeldt collected a number of pebbles and began to toss them in every direction. After a long time, he finally heard a metallic ping. He reached out, picked up his flashlight and made the unpleasant discovery that it, too, had been broken in the fall. Never separate yourself from your cave pack. Eventually, the ill-fated caver heard distant voices calling his name. As beams of light suddenly illuminated the shadows around him, Ron Kummerfeldt saw his backpack -- which contained the spare bulbs he needed -- only a few meters in front of him. Cave exploration has a long history and over the years certain guidelines have been developed, inevitably based on the catastrophes and near misses experienced by people who love to wander underground. Check them out at the end of this article. The inexperienced spelunkers who end up lost or dead in a cave, frequently start out with the basic gear that would appear sufficient for the task they have in mind: a flashlight, perhaps two, and maybe even a hard hat. They are ready for an adventure that they can see in their mind's eye. What they're not ready for, however, is the arrival of the unexpected. This could be a thunderstorm that floods the cave, a "straight" passage that actually goes in a circle, a knot in a rope that should be knotless, an invisible "pool" of carbon dioxide that can suffocate a person in three minutes, a broken ankle, ptomaine poisoning of everyone in the expedition, a huge rock that suddenly detaches itself from the wall of a pit, a swarm of angry killer bees and so forth. As you might guess, all of the above have happened and the list could go on forever. To be somewhat prepared for surprises like --and unlike-- these, check out the guidelines at the end of this article. They summarize procedures that many cavers swear by. Caves open to the public have walkways and guardrails to keep people away from sensitive areas. Wild caves --for example most caves in Saudi Arabia -- have no protection whatsoever. It's difficult enough for an individual to avoid accidentally breaking a stalactite with a simple step backward or a turn of the head. Now imagine a dozen people in that same space. Even if they're all dedicated conservationists, something's bound to get broken. Certain caves should only be visited by very small groups. Once those gorgeous stalactites that took thousands of years to form have been smashed, one can only pick up the pieces and try to glue them back together... a very difficult task. Taking souvenirs is catching. When one person picks up something to take out of a cave, so does everyone else. Take a picture instead! You can mark your route by leaving short pieces of brightly-colored flagging tape on the ground. Pick them up again on the way out. If you have an urge to write your name inside a cave, write it on a Cave Register. This is a list kept inside a tightly closed jar, which cavers often place deep within the cave. Some graffiti have unfortunately appeared in a few Saudi caves. We hope you will help us prevent any future incidents. More than 29 species of bats have been identified in Saudi Arabia so far. Bats are highly beneficial both to man and the environment and should be left undisturbed. 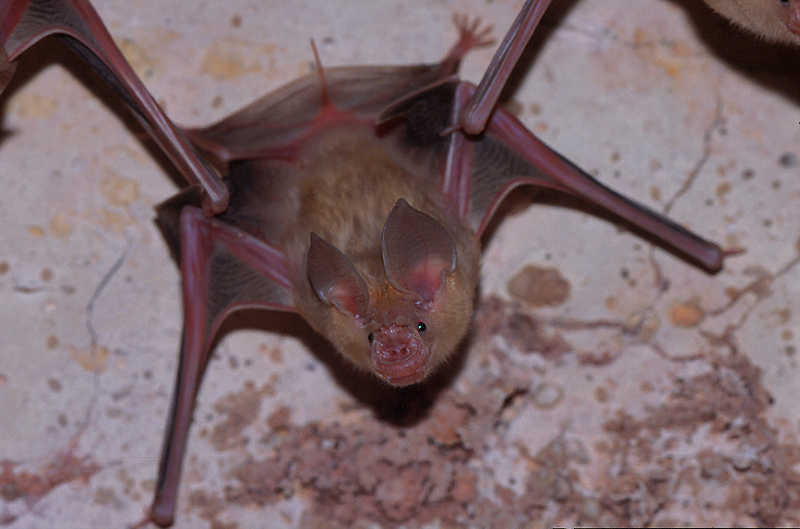 Some bats help control bugs while others pollinate desert plants which bloom at night. If you notice bats in a cave, stop, crouch down and wait a few minutes. Give the bats a chance to get used to the idea of invaders in their territory and perhaps to move off to another part of the cave. Bats are normally harmless, but don't pick up a sick or injured one, as you could get bitten. To learn all about bats in the kingdom, see Bats of Saudi Arabia. For other interesting information on bats, see Bat Conservation International. Many desert caves are located in very remote places, sometimes far from the nearest road or even track. To reach Ghostly Cave, for example, you have to drive over kilometers of tire-chewing lava. As a result, at least one night of camping is often required, and in some cases, the most convient place to do this, with the flattest floor anywhere around, has turned out to be the cave itself. Hibashi Lava Tube is one such place, offering shelter from the heat, cold or howling winds on the surface. 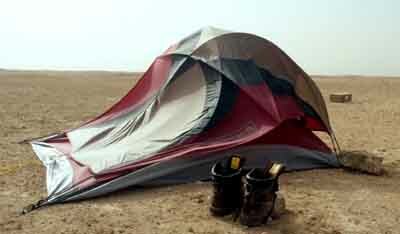 Speaking of howling winds, if you camp in northern Saudi Arabia, be sure to get yourself an expedition tent capable of standing up to a tornado! On the right you can see what my friend Mahmoud's tent looked like after one night in the far North. The following suggestions come from two great teachers: Experience and Awareness. Tell somebody where you're planning to cave and when you expect to return. Take nothing but pictures; leave nothing but footprints; kill nothing but time. Belay people who are climbing ladders or free climbing (Connect them to a rope). Carry three sources of light (per person). Carry spare batteries and bulbs. Go caving with experienced people and learn from them. Keep your cave pack with you at all times. Stay out of the cave if you're not feeling well. If you want to do vertical caving (rappels and prusiking), practice a lot with experienced people, before going near a cave. Then practice some more. learn how to tie knots cavers depend on (like the figure 8 knot).